F.C.C. manufactures clutches through an integrated system extending from research and development of frictional materials to assembly of clutches. The scope of our business has been steadily expanding in stride with the development of the automotive industry, enabling F.C.C. to claim the top worldwide share in motorcycle clutches. Our global production system consists of 22 manufacturing facilities covering 10 overseas countries in addition to our Japanese facilities. 1, Friction materials lie at the core of clutch performance. F.C.C.’s clutches have evolved with emphasis placed on the development of this critical element. F.C.C. is determined to bring to bear more effort on developing friction materials meeting the needs of the times, including performance, cost, and environmental protection. 2, We supply many different kinds of clutch friction disc for motorcycles, scooters, three-wheelers, atv, such as Honda, Yamaha, Suzuki, Kawasaki, BMW, etc. 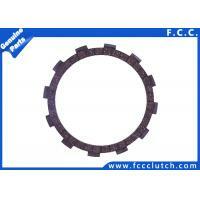 3, We are the leading clutch friction plate manufacturer in the world. We can supply both cork and paper based clutch friction disc. 9, ODM or OEM order is acceptable. Our products include automobile clutch, motorcycle clutch plate, clutch assembly, center clutch assy clutch hub, clutch housing, pressure plate, clutch spring, clutch steel plate, clutch outer assy, weight clutch etc.